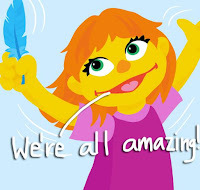 SingleMomtism: Just A Reminder About A Great Autism Resource: Sesame Street! Just A Reminder About A Great Autism Resource: Sesame Street! Saturday was World Autism Awareness Day (as my Facebook and Twitter accounts screamed all day) and April is Autism Support Month. I'm going to be using Mondays throughout the month to try to highlight some terrific resources, and I'm going to kick it off with the grandaddy of all educational resources - Sesame Street! Did you know that in addition to their autistic character, Julia, they also have an entire website filled with resources for parents and children alike, teaching inclusiveness, acceptance, and diversity. In addition, they have these amazing Daily Routine Cards for parents of children on the spectrum, since the use of "storyboarding" is such a helpful tool for children with autism. There's a lot to see and do and learn on the site - give it a look! Fun On A Friday - Time For "Today In The News"
Mostly Wordless Wednesday: London, Here We Come! What Are Your "Small Pleasures?"